Journalists won’t admit this often, but they tend to be pack animals. I got my first sense of this while hanging out with foreign correspondents and journalists in Turkey–and I later worked with international news organizations as a local organizer and translator. All the journalists, and all their camerapersons, and all their crew, and even their local workers seemed to not only know each other very well, they were almost always together. You could literally spot them from a distance as a large mass of people with their gear, lights and correspondents fixing their hair before going on the air. Staying in the same hotel. Hanging out in the same bar. Attending the same press conference. Going to the same event. Taking the same picture from near-identical angle. Packs often made their decisions collectively as well. While I was in Diyarbakir, Turkey, for example, with one of those large packs covering ongoing unrest Northern Iraq, we were told that the roads were unsafe and travel was not possible via the usual routes. The journalists pushed and prodded and looked for alternative ways—but, in the end, “the pack” gave up and settled into an uneasy wait, eating kebabs and watermelon in the lovely “Kervansaray” hotel we were all staying in. (Yes, journalists also all stay in the same hotel because there is often only one reasonable hotel in an area). Some, though, abandoned the pack. Christian Amanpour, for example, took off in the middle of the night through a circuitous mountain route. And I know she made it because I ran into her about a week later at the border when she approached me out of the blue and said, “Hey, are you Zeynep?” Yes, I said, and I ventured a guess that I just woke up in an alternate universe where I was the notorious one instead of her. Truth was, a producer I was working with had asked her to look for me to deliver a message–and there weren’t that many petite brunette women hanging out at the border in what was then a serious conflict region. My alternate universe was deflated but she was indeed in an alternate universe than my pack as she had been in Northern Iraq the past few days while we waited. This awareness that traditional journalism is often poorly-sourced, and what appears as many reports is actually a single report, is partly why I was encouraged by the explosion of citizen journalism enabled through social media. News outside the pack, I thought. Many, many, many sources of news instead of the eyes of a united pack. I understand why journalists stay in those packs—they are often navigating their own way around unchartered territory, worried about safety, and also worried about being scooped. If everyone has the same story, more or less, things are okay, more or less, professionally. But it certainly results in poorer, thinner news. With shrinking number of foreign correspondents, and with too few correspondents covering too many countries (too big a beat – how can one person cover all of Middle East? ), and too little time in any one country, it just makes sense to stick together. However, journalism isn’t just about multiple sourcing. Journalism also isn’t only about knowing the area one is covering, but it is also about knowing the audience one is communicating with, knowing how to evaluate and bring facts together, and knowing how to evaluate and tell a story to that particular audience. It’s a two-way street with competencies required on both sides of the equation, both compiling and presenting the news. Hence, we still need journalists who can stand between the multitudes of citizen journalists and news sources to apply the craft of journalism to produce the best stories: to construct narratives, to evaluate news and rumors, and finds ways to most effectively communicate with the audiences. One such journalist to emerge in the last year’s events has been NPR’s Andy Carvin who’s been “anchoring” a Middle East based newsfeed on Twitter since December of last year when the Tunisian uprising began. His timeline has emerged as an “oral history”, a curated story, and an important source of on-the-ground news from the uprisings sweeping the region. Another example is Robert Mackey who writes “The Lede” blog for the New York Times and often covers very important stories. However, there has also been backlash and rejection of this kind of journalism. The criticisms are not invalid and should not just be dismissed as old-fashioned. While many accept that it is useful, a common issue which comes up is: “how do you know what you hear on social media is true?” I think that is an important question and one that requires a lot of thought and study and expansion of the craft of journalism. Here, I want to examine some aspects of that question to highlight a key difference between traditional journalism (and its shortcomings) and social-media-based journalism (and its shortcomings). 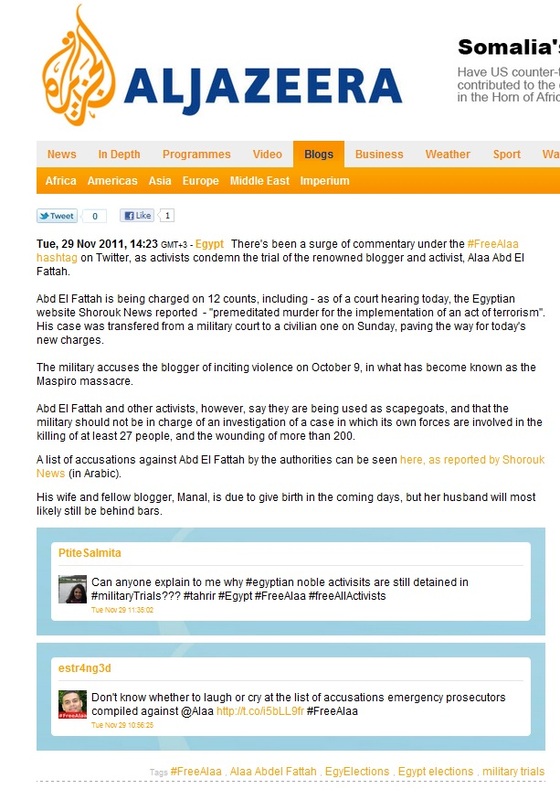 My case study begins yesterday when the prominent Egyptian newspaper Shorouk posted an article stating that prominent Egyptian blogger Alaa Abd-el Fattah, whose case was recently transferred from military to civilian courts as a result of pressure from Tahrir and elsewhere, was now charged with premeditated murder, among other charges, for his activities the night of the Maspero killings in Egypt which resulted in the death of 27 Copts during a protest march. 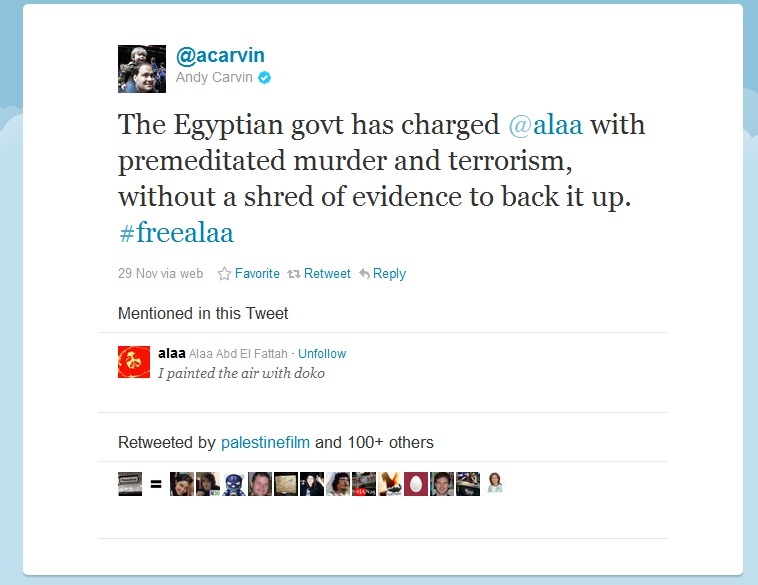 Alaa is well-known by many people in the West (including Andy Carvin and myself) and the charges were fairly ridiculous even before premeditated murder were added. 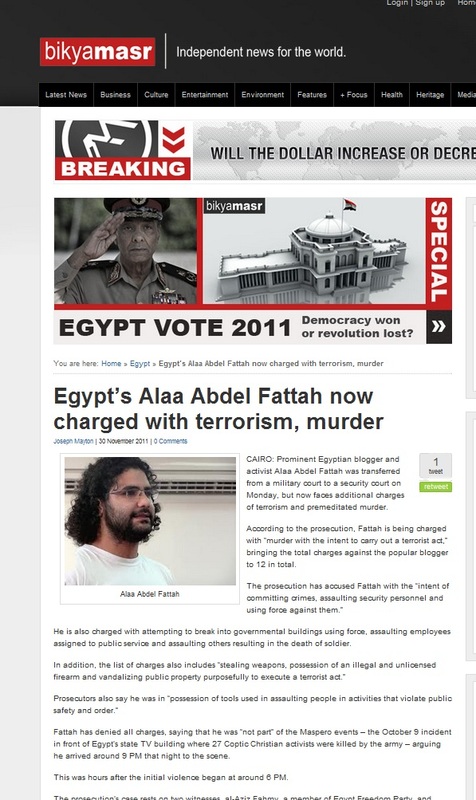 Alaa is a lifelong activist and blogger and he had written extensively about his efforts that night in question and it seems pretty clear that his effort was all about documenting the killings–and the idea that he’d be out there with guns killing people was quiet shocking, pretty impossible to believe, and also a potential capital offense—putting the life of one of Egypt’s best thinkers and democracy activists on the line. Just as Andy Carvin started asking around for confirmation on this story, Al Jazeera English posted an item reporting the same story on its story. 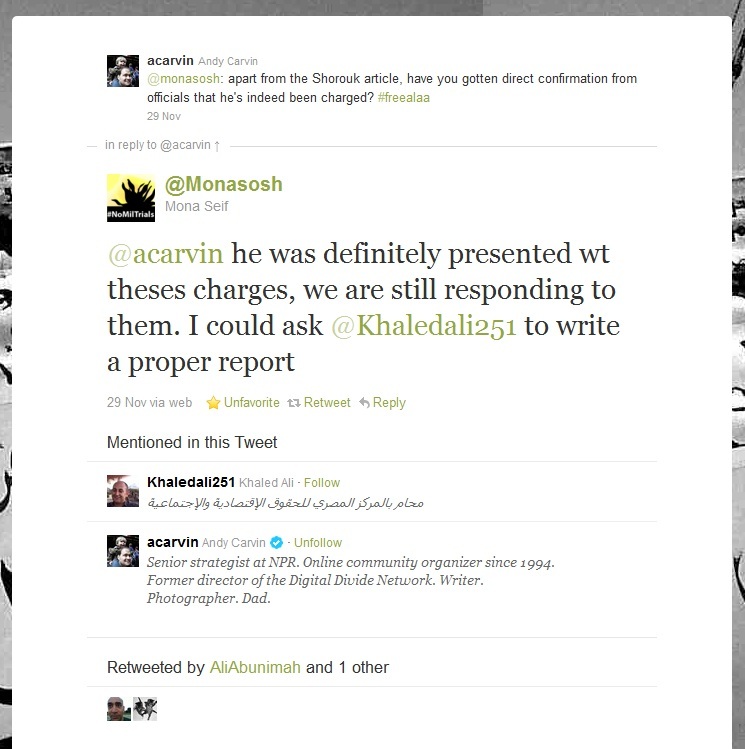 However, that too, was based on reaction to the Shorouk piece and did not have independent confirmation. However, it soon started emerging that maybe Al Shorouk had it wrong. 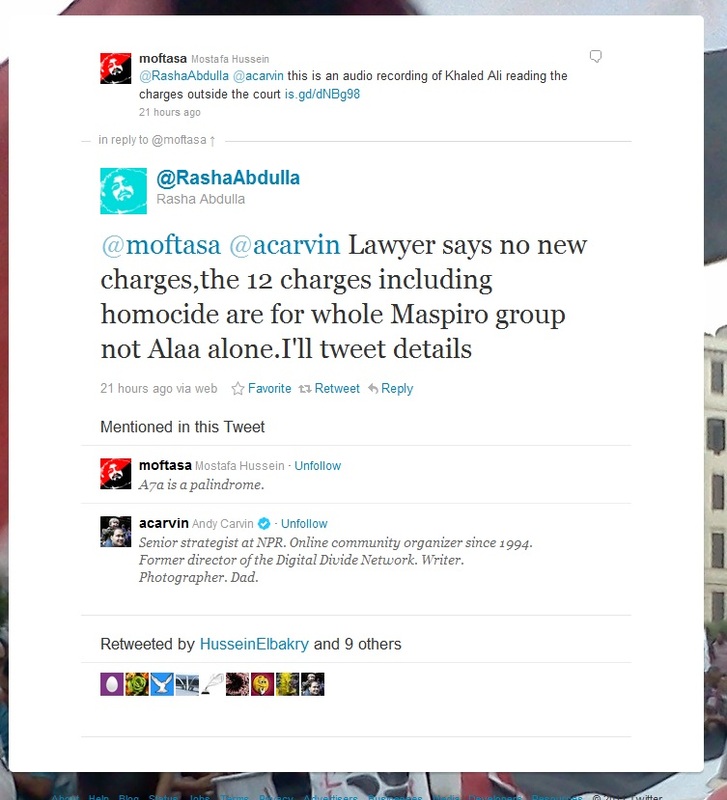 Another twitter user and physician Mostafa Hussein posted the audio of Alaa’s lawyer explaining the charges, and twitter user and AUC professor Rasha Abdulla reached the lawyer by the phone. 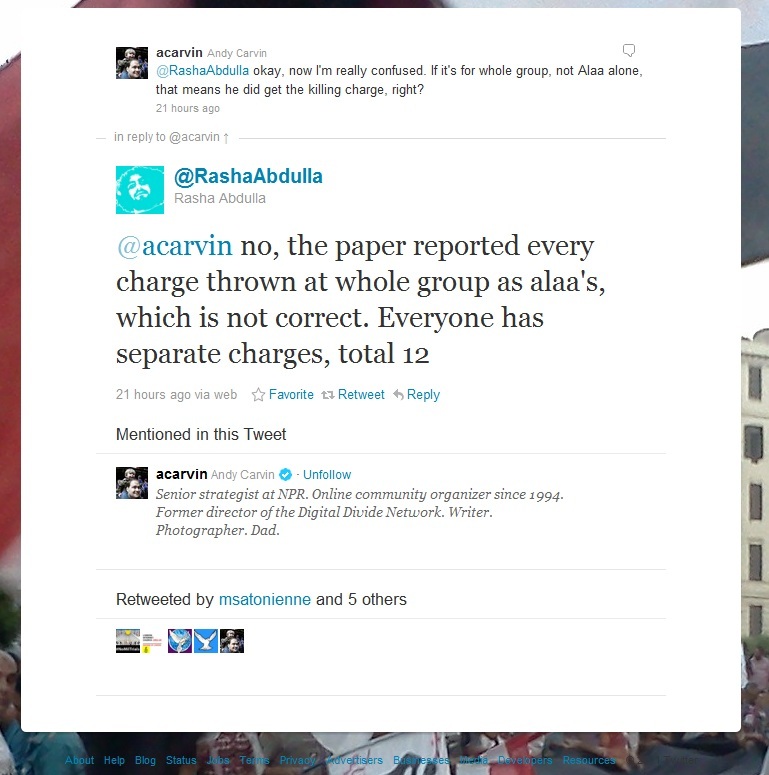 (Although later that night, Alaa’s sister posted this answer to me which seemed to suggest there might be “group charges” including Alaa, although Alaa’s wife @manal, seemed to think not). In the end, though, it seems that the correct story is that there are no new charges, and the process is just convoluted and confusing for many. The full story of how it played out can be seen in this Storify by Andy Carvin. This case is very informative in identifying weaknesses and strengths of social-media based journalism. Let’s look at how it works best and how it fails, as it did in this case. 1- Triangulation needs to be more explicit and cautious. The strength of social-media based journalism lies in its ability to deviate from the “pack” behavior, which as I explained often necessarily dominates traditional news reporting. (To be clear, I am not just blaming traditional journalists; this is a structural issue. Too few journalists are covering too varied stories and this forces them to stick together to well-beaten paths). However, as we saw in this story, online cascades can also be a kind of pack behavior as well. Al Shorouk got echoed by Al Jazeera which got echoed by Andy Carvin, which got echoed by even more news outlets, which got echoed by many of us. Hence, when triangulating, it is important to make sure that it is not an echo chamber but genuine multiple reporting – and that can really be best done by incorporating more citizen journalism as well as more professional journalists into the mix. 2- Evaluating personal confirmation at cross-cultural, cross-linguistic transition point remains the weakest inflection point. 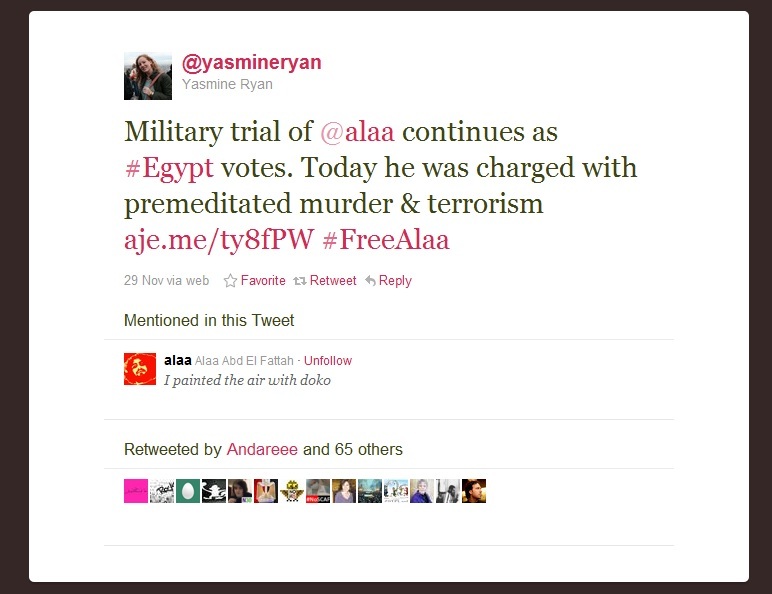 In this case, I was aware that Al Jazeera’s reporting was not independent; however, Alaa’s sister seeming to confirm the case was a clincher for me. It turns out to have been a possible misunderstanding. Thus, when communicating with people in different cultural/linguistic settings over social media, there needs to be better ways of evaluating the information and also being more explicit about needing more sources. Traditional journalism doesn’t always do that well in this regard either, but the process is more opaque and less visible (good journalists, however, are the ones who do this well). The visibility of the process in social media-based journalism makes it more open to criticism about errors, which are also more visible. This transparency should be seen as a moment for improvement, not for returning back to the days of more opaque, unclear paths. This is a potential moment to address one of the biggest weaknesses in foreign-news journalism, that journalists are not part of the story they are writing and are, almost by definition, lacking in understanding of the context, by combining it with traditional journalism’s greatest strength over citizen journalism, that journalists are not part of the story they are writing, and thus are in a position to better evaluate multiple points of view and news with careful verification and a skeptical eye. Whether citizen or professional-journalism based, the greatest threat to developing a factual, contextual narrative across borders and cultures occurs at that inflection point when news, information and viewpoints are being transferred from one country/person to another country/person, especially through a language barrier. 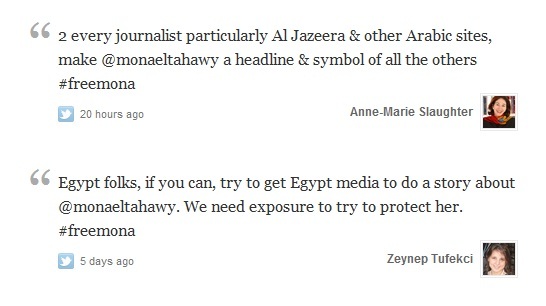 (Yes, I’d love to see more Arabic speaking American journalists who specialize in covering Egypt, for example.) Social-media based journalism makes that point much more visible and scrutinizable. Such scrutiny should be welcome and stronger methods developed. 4- Process Journalism vs. Product Journalism. The key difference between a traditional news organizations and social-media reinforced journalism is often in the visibility of the process versus the presentation of a final product. One reason that social-media journalism comes under fire more often is that the process is more transparent, and necessarily includes more explicit errors, which are almost always corrected rather quickly, but through a messier process. While traditional journalism, too, admits their errors, the news is presented as a product, not a process. Hence, when New York Times made egregious errors in the reporting of the alleged weapons of mass destruction in Iraq, errors it was challenged on *at the time* as it was making them by many experts and other news organizations but which the Times ignored, the consequences can be devastating as many other news organizations take the lead of New York Times and also because many people trust it. While these errors were corrected many years later, and the New York Times issues a lengthy apology, the war was done and hundreds of thousands of lives were lost or destroyed. Errors in social media, however, tend to get corrected much more visibly and quickly as the challenge itself is more visible and apparent. Hence, it’s just not the case that product journalism, which presents products in an infallible-seeming manner is always the best journalism. Integration of visibility into the process (less reporting about what “senior unnamed sources leaked” for example, as that is an obscuration and should be done very, very judiciously rather than as a routine process) and more explicit integration of factual challenges would improve all journalism. 5- Process journalism is more demanding from the audience. 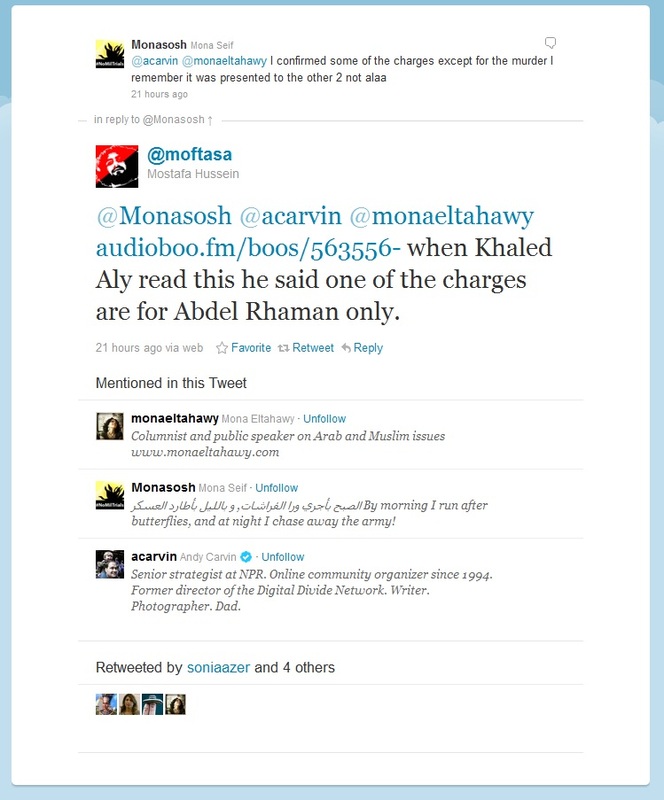 Even long after correct information about Alaa’s charges came out, tweets replicating the earlier, incorrect information were reverberating through social media. There is a two-fold problem here, one which replicates problems with traditional journalism and one which goes beyond it. First, in traditional journalism, too, corrections are seen by fewer people than those who see the original incorrect information. However, in social-media based journalism, since the process is more transparent, there are bound to be more error-corrections. At the moment social-media based journalism requires great effort and attention to follow. For example, the number of people who retweet an original tweet are often far greater than the number who will retweet a correction. Considering that a tweet may then be re-re-retweeted through a network, it becomes hard, if not impossible, to ensure a correction reaches all those it should. (In the Turkish press code, which is hardly exemplary in other respects, court-ordered corrections have to be issued *in the same place with the same font* as the original story. That should be true for all corrections whether in traditional or social-media based journalism but how to achieve that remains elusive). In other words, while many people may just want to eat the sausage, social-media requires that not only one watch sausage being made, one watch very carefully. That is not a reasonable expectation if a more democratic, wider and correct information diffusion is a goal as systems requiring more effort almost always increase inequalities. The rich –those with attention, time and know-how– will likely get richer while others will be left behind confused. Yes, we need more people to understand better how the sausage is made, and sometimes watch how it is made, it is not reasonable or a positive contribution to the public sphere if only the people who have the time, attention and resources to watch and understand the whole process are able to enjoy its fruits. 1- Journalists like Robert Mackey, Andy Carvin and others who straddle worlds of social-media generated citizen journalism and traditional journalism are key to ensuring that this emerging resource is made accessible. Often, Mackey’s “The Lede” blog and Carvin’s feed become key sources of important news which is otherwise not covered much, if at all, by the traditional sections of the organization. It’s not that we need social-media journalists, but beat journalists who know how to incorporate social-media as a key resource. 2- We need better technical tools as well as more people using them. Tools such as “storify” which allow one to “make a story” out of tweets are useful but are barely the tip of the iceberg of what’s needed. For example, it would be great if one could “tag” tweets as “if you accept this tweet, you also accept one more tweet to be sent later.” This could be an opt-in feature and be limited to one tweet per original tweet. I certainly wish I was able to reach everyone who might have seen my earlier, later shown to be incorrect tweets. Many tools are needed and someone needs to create them. I was happy to recently hear that Columbia school of journalism has five students majoring in journalism and computer science. May this model spread, and may developing new platforms for journalism also be seen properly as journalism–as it requires a proper understanding of the craft and process of journalism, not just how to code, to create these tools. 3- Pack behaviour of traditional journalism is sometimes being replicated in the cascade behaviour of social-media based journalism. This can be fought against by incorporating *more* citizen journalism and openly encouraging challenges. @Mostafa and @Rashaabdulla, in the end, were the ones that did the journalistic leg work in this story and neither are professionals but both are known as careful and trustworthy individuals. 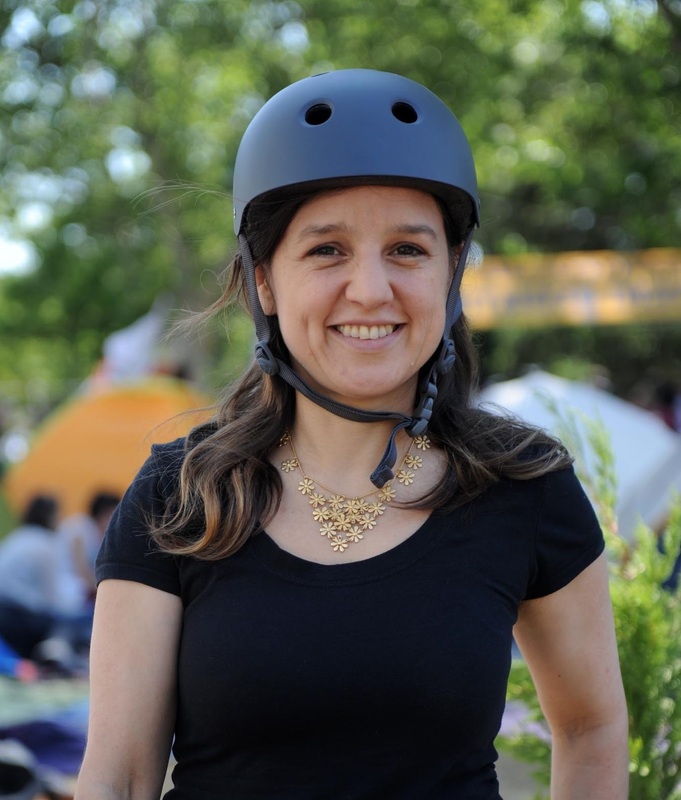 This brings us back to the importance of beat –I trusted Rasha’s reporting, for example, because she is a a fellow professor, social scientist and a colleague and I know her to be careful with facts. For me, it wasn’t about “oh, here’s a tweet” but more about “oh, here’s a person with a solid reputation.” This is no different than what traditional journalism does. In the end, I’m arguing for neither pure process journalism, which is cumbersome for the audience and will likely increase inequalities in the public sphere, nor product journalism, which hides its errors and process under the rug, but a new merger which is aware of its strengths and weaknesses, with strong commitment to factual reporting, context, triangulation, evaluating of sources, claims and facts, as well as an explicit welcoming of challenges, and, above all, welcoming the visibility of errors not as a reason to abandon contributions from citizen journalism, but as an opportunity for improvement and enrichment. This entry was posted in Uncategorized on November 30, 2011 by zeynep. Egyptian-American writer and my friend Mona El Tahawy, who had cut her trip in North Africa short to join the exploding Tahrir protests in her native country, had just sent that out. Short, uncapitalized, clearly written in a hurry. And with that, she went silent. As a scholar and a concerned citizen, I had been following Egypt’s revolt closely. I knew that the security apparatus in Egypt had, in some ways, grown even more arbitrary since the ouster of long-term autocrat Hosni Mubarak after 18 days of intense protests in Tahrir. About 12,000 civilians had been detained and were subject to “military trials”. Since the eruption of new protests, at least 35 protestors had been killed and thousands injured. A few weeks ago, a prisoner, Essam Atta, had been tortured to death in prison. At worst, Mona’s life was in danger. At best, she would likely be subject to beatings, sexual abuse. As I stared at the tweet as my mind raced back to my conversations with Mona about her days in the American University of Cairo and her lifelong, outspoken opposition to Egypt’s autocracy. Because she was a Guardian columnist, a prolific tweeterer and a public speaker, she was identifed with the Egyptian uprising by many. She would certainly be in trouble with her country’s military rulers. Her tweet stream indicated that she was near Mohammed Mahmoud street, where clashes had been going on for days between protestors and CSF, the paramilitary police. Most likely, I thought, she was apprehended by people who did not know of her global standing, but saw her as a woman out in the street late at night involved in protests–and I knew this too would be a big danger to her. Soon, though, mid-level higher-ups would discover that she was relatively well-known–and her treatment from then on would likely depend on public reaction to her arrest–both in Egypt and globally. Prominent Egyptian activist and my friend Alaa Abd-el Fattah, who is now in prison under the military trials regime, was also arrested in 2006 and spent six months in Mubarak’s jails. 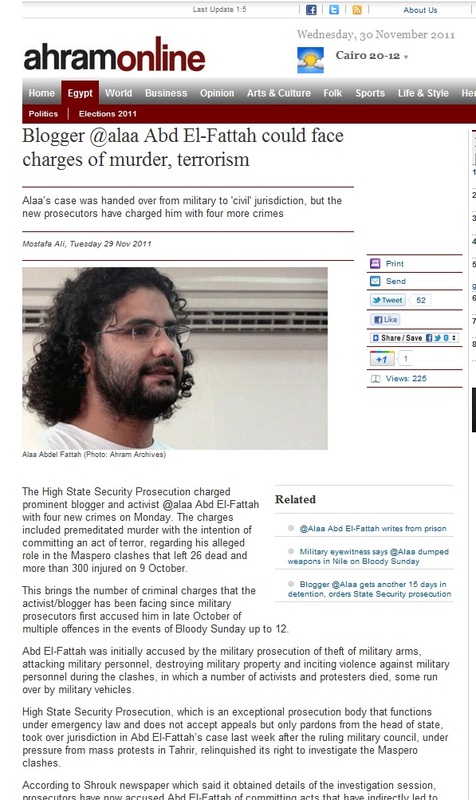 Alaa later stated that the global campaign to free him probably caused him to spend more time in prison, as the regime realized they had a valuable target, but also spared him from torture. When activists are arrested, in some cases, it is best to keep it quiet. In some cases it is best to kick up a big storm. Worst option, however, is to kick up a small storm which irritates the powerful, but without enough strength to nudge them to action. Considering the options, I thought Mona needs the latter, and probably cannot be quietly freed anyway. As a woman, she’s in danger from the low-level police who now have her at their mercy. She needs to be plucked out of there, and that requires high-level intervention. As a prominent dissident, she is in danger from those higher-ups who might want to make an example of her the way they are currently doing with Alaa. Mona needed a huge campaign which made it costlier to keep her than to release her. A few decades ago, contemplating launching a global campaign like this would require that I own, say, a television station or two. I hadn’t even unpacked my television set when I moved to Chapel Hill to take up a position as an assistant professor in University of North Carolina. Heck, I dodn’t even have a landline phone. But, “I” wasn’t just an “I.” Due to my academic and personal interests, I was connected to a global network of people ranging from grassroots activists in Egypt to journalists and politicians, from ordinary people around the world to programmers and techies in Silicon Valley and elsewhere. My options weren’t just cursing at a television set –if her arrest had even made the news in the next few days. I could at least try to see what *we* could do, and do quickly. Concise, fast, global, public and connected was what we needed, and, for that, there is nothing better than Twitter. I immediately reached out to Andy Carvin, NPR journalist extraordinaire who’s been covering the Middle East uprisings, and a friend of many years going back digital divide efforts, a topic which I’ve long studied as a scholar. I was very happy to see he was online and, of course, similarly aghast at Mona’s situation. One challenge of new media environments is that they scatter attention and consequently tools and channels which can unite and focus attention are key to harnessing their power. Hashtags and trending topics are one way in which people can focus among the billions of tweets floating in cyberspace. In fact, a key dynamic in “social media” is that it works best when coordinated with “focusers”: trending topics, Al Jazeera, Andy Carvin (whose stream is widely followed) are all focusers, albeit very different ones (Well, one is a satellite TV channel, one is a cool guy with a very cute, huge dog, and the last one is an algorithm). Hence, the “Occupy” movement was deeply disappointed when Andy Carvin did not cover them, as his beat was Middle East, and as he already works about seven days a week. Occupy activists knew that without Carvin, they had lost a potential focuser. (Police brutality and overreaction solved that problem for Occupy movement by garnering traditional media coverage which served as a crucial focuser). So, first, I knew we needed a hasthag. A focuser. Wanting a short one due to Twitter’s character limits, I proposed “#Mona”. 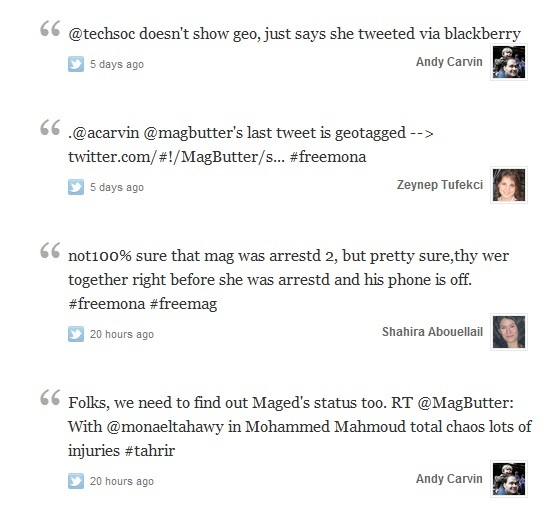 Andy quickly checked and realized that it was already in use and suggested “#freemona.” I tweeted out an agreement and opened a column in my Tweetdeck to check only tweets tagged “#freemona”. In about a minute, the column started flowing too quickly for me to read everything. 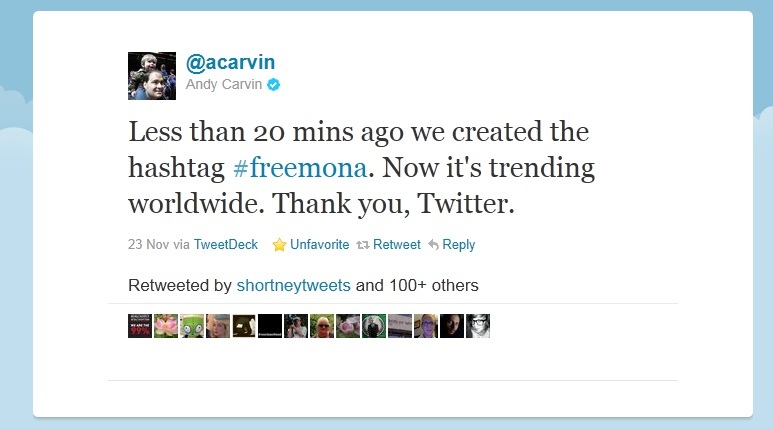 20 minutes later, #freemona was trending worldwide. Ok, that’s the global campaign, I thought as I marveled at how quickly it had taked off with barely a nudge. In the pre-social media world, it might have taken weeks and a lot of luck to achieve even a sliver of such awareness globally. But that wasn’t the only leg of our frantic, crowdsourced efforts. @Cairowire, curated by @sarahbadr, contacted the US Embassy — and informed us of this fact on Twitter so we could avoid flooding them with calls. She live-tweeted her call so we could provide as accurate information as we knew in response to questions from the Embassy. Was she a US citizen? I knew she was, and others chimed in. Where was she seen last? What was her birthday? I looked it up and answered. Who was she with? People chimed in with what they knew. 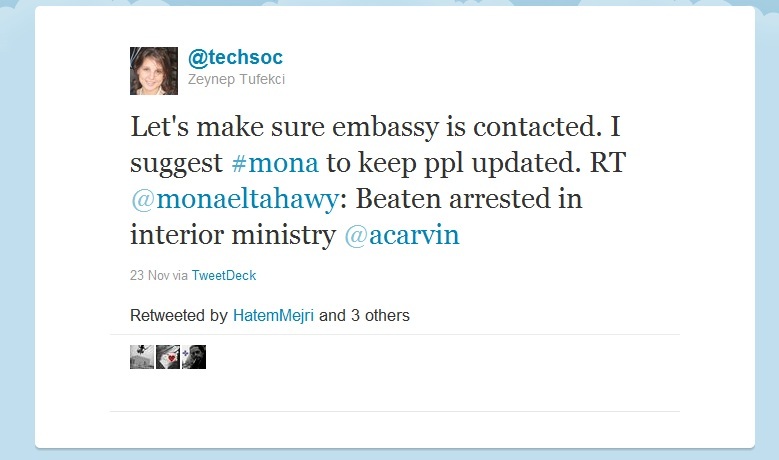 @Cairowire told us the embassy had taken down the information. Many times, the most dangerous moment for a dissident or an activist is the police station where low-level functionaries can have impunity to do the worst. The combination of her gender, personality, citizenship and her role as a media person was a very dangerous mix for that “police station” phase. We needed to try for very high-level intevention to pluck her out–and it was almost 4am in Cairo and a holiday in the United States. Egyptian activists on the ground, who had been organizing against the arbitrary arrest and detentions, were best placed find her and to provide her with legal and other resources. Cairo never sleeps, and, sure enough, many of them were online. 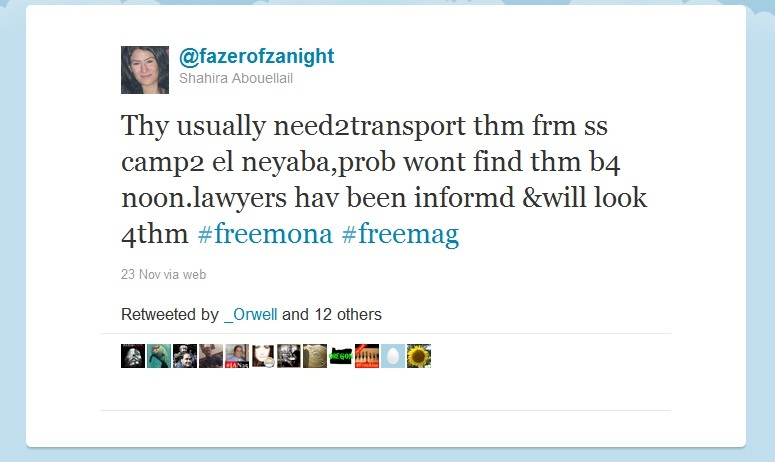 Shahira Abouellail, @fazerofzanight, who works tirelessly with the no military trials campaign responded quickly and informed us of the likely sequence of events, places she might be at and that she would make sure that lawyers would start looking for her early in the morning. (In fact, all through last week, Shahira had been talking about all the people being detained, beaten and abused as the protests grew). This, of course, is naïve. Egyptian army absolutely gives a damn about social media. You only need to notice that they have their very own Facebook page and release their “communiqués” solely through Facebook.. Why? Because, like all repressive regimes, they realize that their power rests not just on coercion, but also a degree of legitimacy and acquiescence among the public–and the public sphere increasingly incorporates networked citizenry on social media. 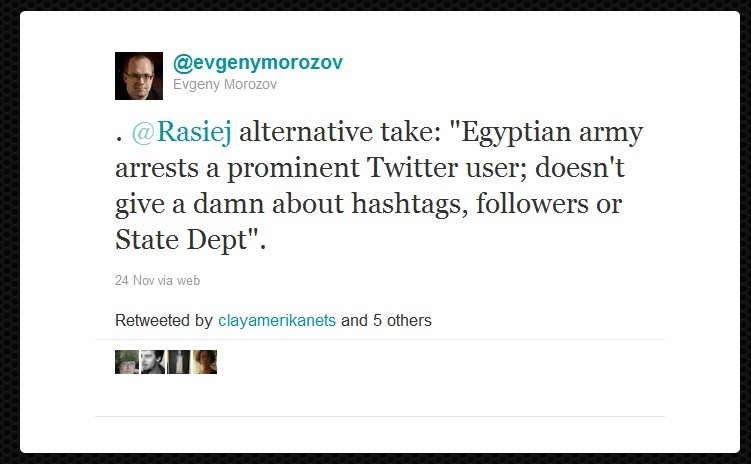 Hence, they are there where they rightly perceive many Egyptian activists and citizens are. In the 21st century, no regime worth its salt will ignore social media; those who do will find themselves looking for places to retire. In fact, I know of no better proof about the power of social media to potentially empower dissent than the numerous anecdotes in Evgeny Morozov’s book about the extraordinary efforts authoritarian regimes go to suppress, control and censor social media. If it were actually irrelevant, they would have happily ignored it. Instead, they are on full-alert, attempting to fight social media on all cylinders. It’s also naïve to think that the Egyptian army does not give a damn about the State Department, especially when it comes to releasing activists. SCAF, like all repressive apparatus, makes calculations about costs and benefits–and keeping a prominent journalist in detention becomes more costly when combined with a global publicity campaign, State Department pressure, Egyptian activists, as well as local and global media coverage. Of course, such global campaigns also play a role in how State Department acts. State Department is the foreign policy arm of the most powerful country in the world and, as such it will act according to what it perceives as the foreign policy interests of the United States. However, global campaigns can make it harder for foreign policy interests of the United States to align with supporting repressive regimes. (I personally and strongly believe that the true and long-term interests of the United States also lie in this direction and that historians will look at its support for repressive regimes as colossal mistakes). I believe that social media can help us organize to make sure big governments are pushed to do the right thing. Besides, State Department, like any other institution, is composed of people and I am sure some of those people would rather help do the right thing. “The Whole World is Watching” is such a resonant slogan for a reason. So, it was a perfect storm. A global social media campaign, institutional power, grassroots Egyptian activists, network-savvy global players and traditional media converged upon Mona El Tahawy’s case. It had been merely a few hours and I thought that all that we could do was done. People on the ground were aware and mobilized, global media was covering the event, official attempts were being undertaken, and a global conversation of concern was taking place in the still dizzily flying #freemona column on my monitor. I went to bed, still buzzed from the frantic activity but in need of some rest. Was she freed because of the global campaign? While it is always important to carefully consider the evidence, in social science, always beware of people who automatically say “But you haven’t proven it!” because that shows they either don’t understand how social science works, or they do and they are disingenuous and are seeking argument for the sake of argument or attention. That’s just now the way it works in social science. Social scientists do advance knowledge. As always, the more data the better. However, almost always, data remains suggestive and associative (it seems more of X was associated with more of Y). In order to understand a dynamic, we also look at causative mechanisms, narratives, comparative cases and limits — what’s missing and not happening as what’s not happening can be as useful. Good analysis in social science also requires good theoretical understanding which basically means correctly conceptualizing the dynamics in play. Start wrong, and you aren’t going anywhere. Most important conceptual point is this: The idea that “social media does help make X happen” DOES NOT mean it was just social media–because that is a theoretical stance which views social media as not part of this word. In fact, critics of social media often fall into this trap as they keep repeating “it wasn’t just social media” as if that were a valid criticism. To state “it wasn’t just social media” is a mere and trivial description of the world, not an analysis of dynamics of how social media plays a role – was it big or small? Was it crucial or trivial? What were the pathways? “It wasn’t just social media” is not a refutation because as stated, that sentence is devoid of cognitive content. This theoretical stance is also why I try to avoid terms like “virtual” because it suggests something “not real”. Social media is “real”, as real as anything else out there. Nathan Jurgenson and PJ Rey call this “augmented reality”. I prefer to call it just reality. The interesting question is, always, what role did social media play in altering dynamics of an event? And at first level of abstraction, the answer is often, yes, social media played a role because it is now an increasingly integral and important part of communicative infrastructure, part of the formation of the public sphere, part of networked activism, and part of everyday life. In the 21st century, it will be increasingly impossible to do political analyses without discussing social media dynamics as an integral part of the story. 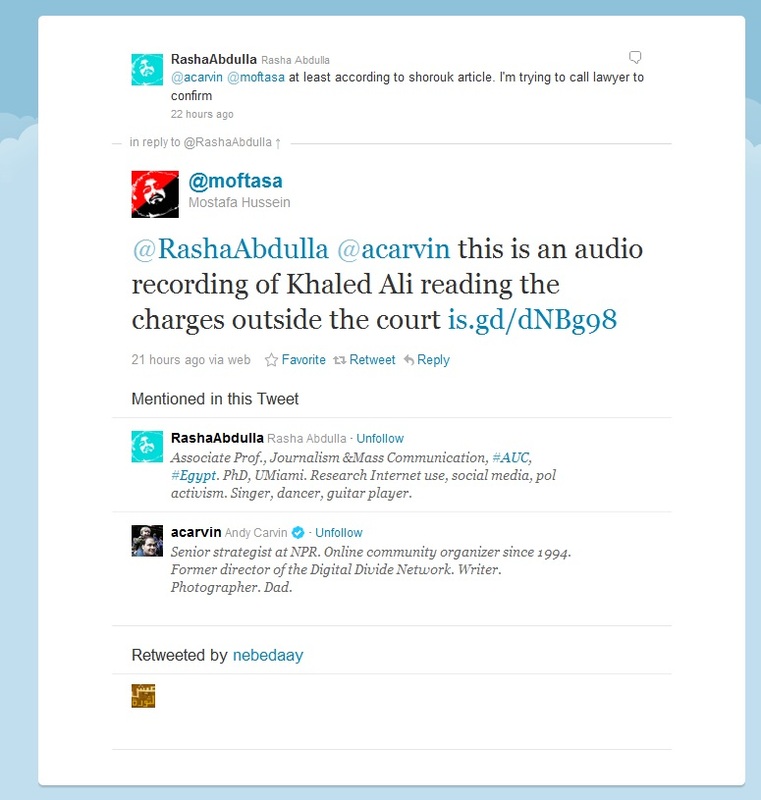 You cannot tell the story of the Arab uprisings, for example, without including the story of the role of social media. Again, though, that is obviously not the only dynamic–how could it be? As Clay Shirky nicely explains here, when people say “Social Media did X”, they mean that it played an important role because that is how the English language works. When we say, “A person was shot by a gun” we don’t mean “the gun got up and shot the person” (well, not yet anyway as robotics may change that); rather, we mean that “someone pulled the trigger and that it is important that the weapon was a gun” –a lot more lethal–than say a pointed stick –much less a danger–or a knife– still dangerous but slower and often more survivable. Hence, the full story of the Arab uprisings will include determined activists, labor unions, human-rights advocates, ordinary people, Facebook and Twitter, protests in Tahrir, dissension within the elites, United States and other governments and many other factors. But, it doesn’t include everything so this is not a laundry list. Sword fights, for example, were not part of the equation in the Arab Spring as they would be if it were an uprising in the Middle Ages. So, to conceptually analyze the role of social media in Mona’s case let’s look at what it did do, as well as comparative cases of its limits and challenges. 1- Speed. Social media speeds up everything. Without social media, so many people wouldn’t have known so quickly that she was arrested, beaten. With one tweet, she reached out to tens of thousands of people all at once. In the past, there would have been a response, but it would likely have been much slower. A campaign by Amnesty International in the old days might take days to organize, especially during Thanksgiving. And “slower” and “faster” are just not the same dynamic for multiple reasons. In other words, something faster doesn’t give you what something slower would give you, just quicker. It results in a different conclusion. Faster is different. I cannot fathom getting a such diverse group of people ranging from journalists to Egyptian activists to State Department officials responding to the same situation, in a coordinated fashion, so quickly, without Twitter (and a few emails. It was almost all Twitter). Even simple questions can be a nightmare to organize. Who will call the embassy? What’s her date of birth? Who’s arranging the lawyer? Once again, people from Japan to Brazil to Australia to China talked about her disappearance. There is simply no analog to such grassroots-powered intervention in the public sphere, at a global level at that, pre-social media. Yes, it is not one big happy family but it is a level of integration that simply was not there a mere decade ago. Along with all the fractures, divides, inequalities, and conflicts, a networked public sphere has emerged. And it is global. Because Mona was a prolific tweeter, she had interacted personally with many people in the past and that was probably important in her visibility. Before days of social media, she would be just a face on a newspaper column–still powerful, but not as personal. And personal connections matter deeply for human beings. And, yes, personal connections can flourish online as well as online/offline. She wasn’t just a face or a columnist or a public speaker– she was Mona to tens and tens of thousands of people. Social media, like almost new tools, can differentially empower the already connected (rich get richer) as opposed to the completely or weakly unconnected. There are 12,000 people who were detained by military prosecutors in Egypt and many languish in jails without such attention. However, this is not an either/or situation. Whether or not #freemona and #freealaa help others depends on whether they become “charismatic megafauna” –where a prominent example helps the whole ecology– or part of a “celebrity system”–where a few people get the attention in isolation. Charismatic megafauna is how ecologists refer to popular animals such as the Panda or tigers–powerful symbols which help move people to preserve vast amounts of landscape. Ecologists aren’t just interested in playing with cuddly panda or tiger babies, and would like to save the whole ecosystem — but carefully and deliberately put faces of pandas and tigers on their campaigns because of the the way human brain and human societies work. It is just very hard to move large numbers of people without powerful and sympathetic symbols. Mona and Alaa are both such powerful and sympathetic symbols and they are both aware of this. In spite of the fact that his wife is about to give birth to their first child, Alaa refused deals which would have gotten him released if only he would accept a few limits on his speech because he realizes the powerful symbolic position he occupies. In her very first interview, Mona immediately talked about her fellow detainees and how those less privileged than her face much worse fates. Still, though, it is not just up to their efforts whether attention bestowed only upon them. Activists and concerned people must be cognizant of this fraught negotiation between using the power of the spotlight on one person versus using it shine it on wider swaths. This can’t be done just by complaining about the “celebrity” or “star” system as not only is that not going away (because it is a deep human impulse), and it is often the best way to start a campaign. The problem is making sure it doesn’t stop there–and that remains an open question and constant struggle. 7- Traditional big interests remain powerful and, along with dynamics of the attention economy, social media cannot overcome all obstacles (Bahrain. Bahrain). Egypt and Tahrir have managed to capture the world’s heart and interest. The ongoing protests in Bahrain –a smaller, less-populated country where U.S. and Saudi Arabia have much deeper entrenched interests and somewhat more complicated by ethnic tensions– remains mostly off the radar in spite of prominent online organizing and broad participation in protests. That is not to say that social media played no role (it almost always plays a major role) in the Bahrain’s protests. In fact, most of the country is online and the battle for legitimacy is raged both online and in the streets. Without the Internet, the opposition in Bahrain may have never managed to organize and mount such a campaign. With the Internet, it can mount such a campaign but cannot overcome the limits of being a small country in the world’s oil-producing region, hence very big interests aligned against it. (As this story is ongoing, it remains to be seen how it all plays out). I would still argue that social media has made it harder to suppress Bahraini citizens’ aspirations for more democracy and participation. A more complex case is unfolding in Syria (not going into that as this post is long enough) where lack of organized dissent before the uprising makes it very hard to use social media to organize. 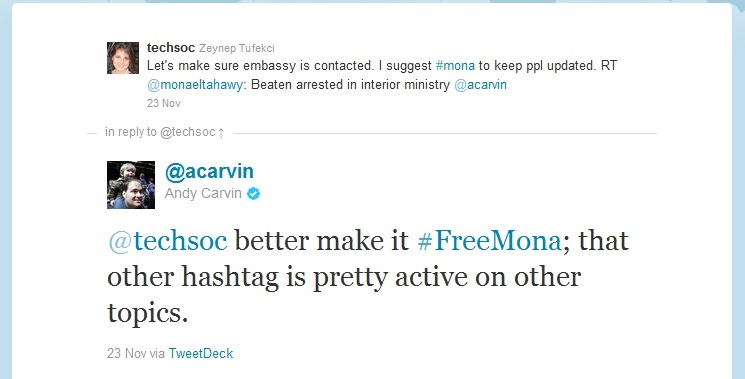 In the end, did the #freemona campaign help free Mona? My conclusion is that it quite likely played a key role, as analyzed in the above multi-layer mix. Without a social media campaign, she might have languished in jail for days or months the way thousands of people on whom such attention is not bestowed in Egypt are languishing in jails. As a U.S.-Egyptian dual citizen, as a columnist, as a prominent social-media personality, and as someone with many personal connections who could be mobilized to help her, she was well-positioned to be helped by these efforts. I also don’t doubt that the attention her case is getting will help bring more attention to the problem of arbitrary detentions, arrests and military trials in Egypt – again, compared to a pre-social media world where there would be zero to no attention, this is a massive step forward. (Added: By no means this is enough–I am comparing with the past rather than making a normative statement). As always, though, a complex mix of causal factors, from protests in Tahrir and elsewhere in Egypt to international geopolitics will structure the future of Egypt. It is also clear that the networked public sphere is now an integral, causal dynamic in this multi-dimensional, multi-causal system. This makes it even more important to move beyond trivial denounciations –“it wasn’t just the social media”– to a deeper understanding which looks at specfic actors, dynamics, networks and beyong to understand, and also, to change this world. PS. Edited the evening of Friday, Nov. 25 to correct typos, add links, and slightly clarify a few sentences which were missing words. May continue to edit for typos and for adding links. On Monday, November 28th, I added a few more tweets using the excellent storify by @katz which can be found here. This entry was posted in Uncategorized on November 25, 2011 by zeynep.